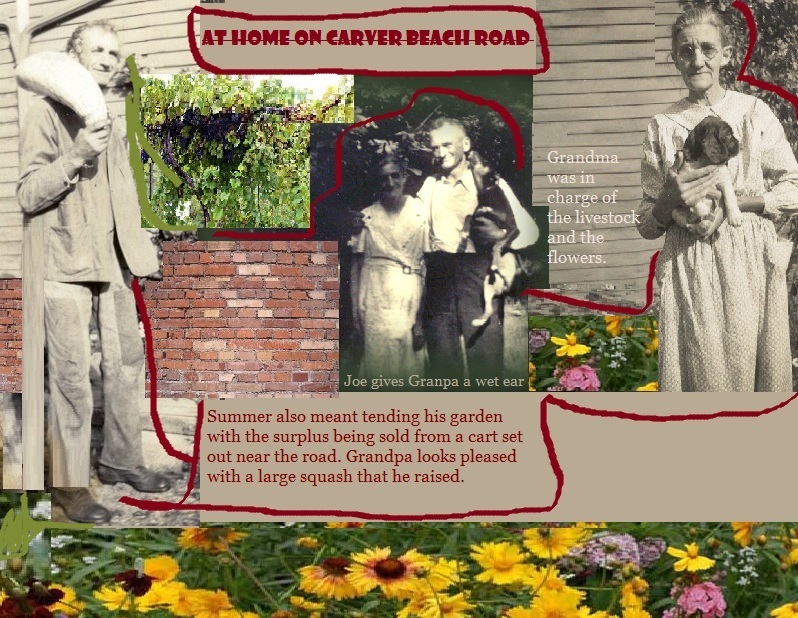 It was either while Dad was in the CCC’s or shortly after his return in 1935 that Marie found a place for Grandpa and Grandma close to where she was working. Grandpa had been hit by an automobile and spent quite some time in the hospital. His deafness may have been a contributing factor. The accident, probably happened during the time he was working for the Collis Company. After the accident he was no longer needed at Collis or able to hold a steady job. 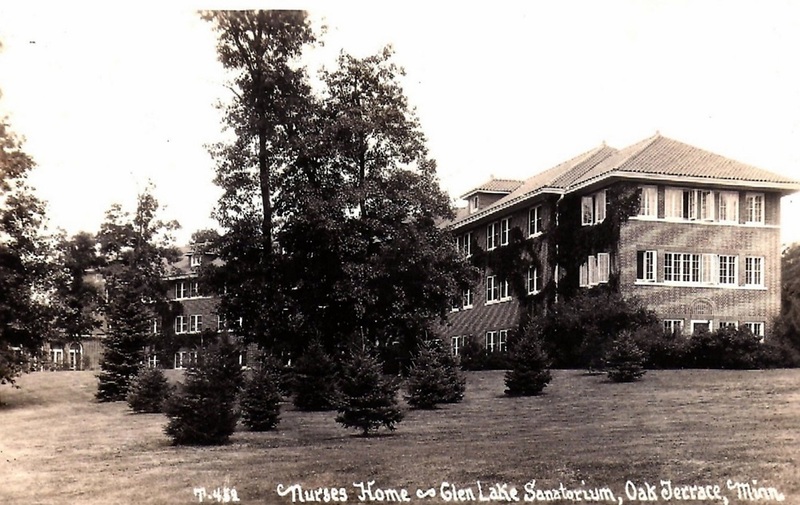 Marie was a nurse at the Glen Lake TB Sanitorium and was living in the nurses residence on the grounds. 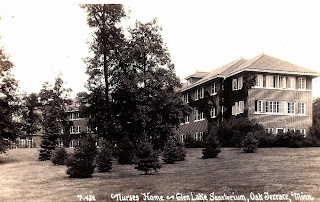 Glen Lake Sanatorium, a tuberculosis treatment center serving Hennepin County in Minnesota, opened on January 4, 1916, with a capacity of 50 patients. 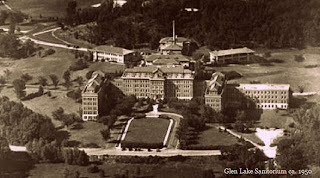 In 1909, the Minnesota State Legislature had passed a bill authorizing the appointment of county sanatorium boards and appropriating money for the construction of county sanatoriums. 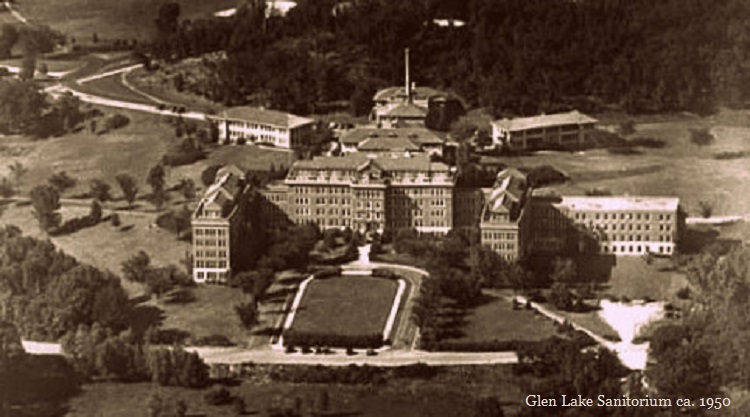 Glen Lake Sanatorium was the fifth of fourteen county sanatoria that opened in Minnesota between 1912 and 1918. The sanatorium had its own post office. 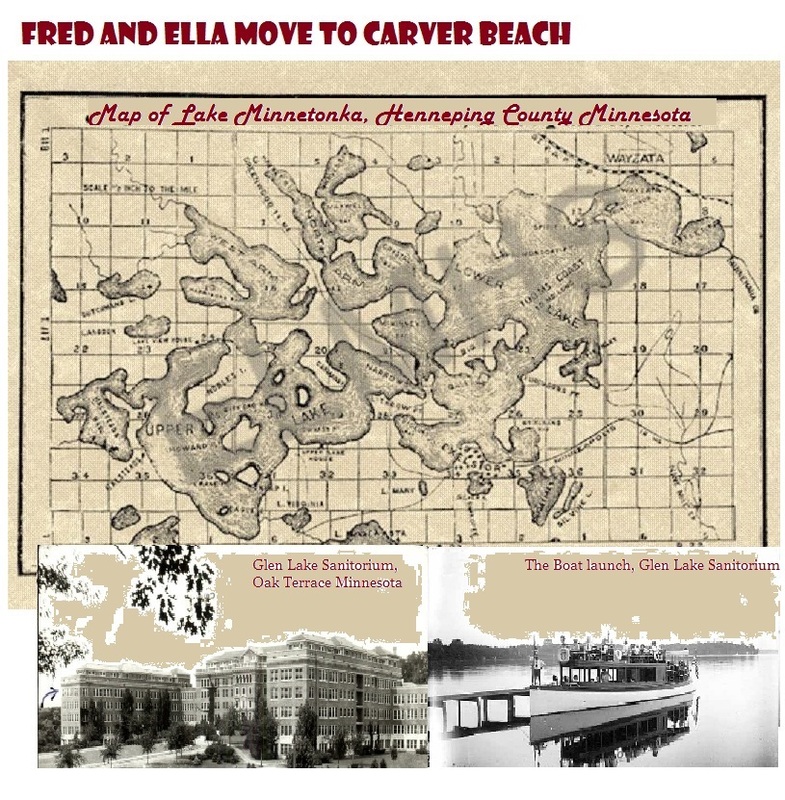 The mailing address was Glen Lake Sanatorium, Oak Terrace, Minnesota, until the surrounding area was incorporated into the City of Minnetonka. "At the height of the TB epidemic in the 1930s, 715 people lived in the multi-building complex and received the best medicine available, plenty of sunshine, rest and good food. The Minnesota Department of Public Welfare (now Human Services) assumed operation from Hennepin County in 1962 and guided the transition from tuberculosis sanatorium to Oak Terrace Nursing Home." The buildings were demolished in 1993 and a 9-hole executive length course was created on the site and grounds. Hennepin County selected Hennepin Parks to operate the Glen Lake Golf and Practice Center as a self-supporting facility. Dad began boarding with the Engelmann family at 566 South Robert. 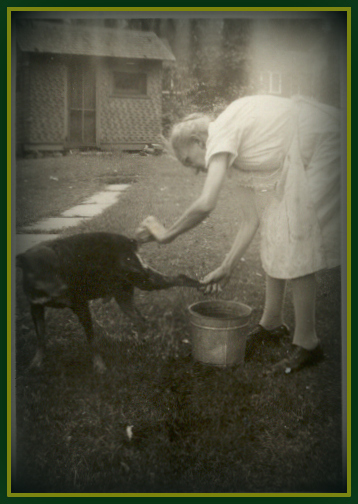 With the help of the older children, Mary kept the household together after her husband David died in 1928. They were neighbors and Dad knew some of the kids. He told me that he moved into Walter’s room when Walter took a bride and moved out. 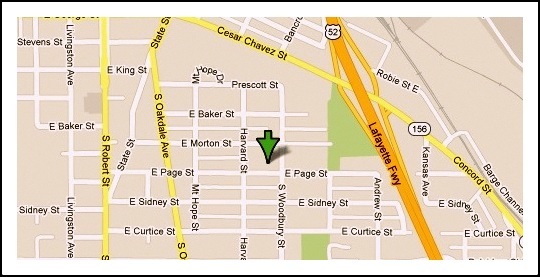 Walter married Loretta Pangerl and they moved in with her parents at 279 E. Page. Joseph Pangerl was employed by the Great Northern Railroad where he worked as a "car repairman". 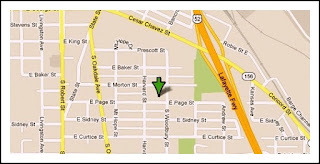 Walter continued his employment as a cloth cutter with Lipschultz Bros Co.
they were living at the same address in 1946 when Walter returned from his tour of duty in Germany. He served as a staff sargeant in the Army during WW II from 1944-1946. Walter and Loretta are buried at Fort Snelling National Cemetery while the Pangerls are buried in Riverview Cemetery. Grandpa and Grandpa are listed, in 1935, as living in the unincorporated community of Carver Beach, Chanhassen Township, Carver County, MN. They rented a small house and adjacent garden plot at an address on Carver Beach Road. 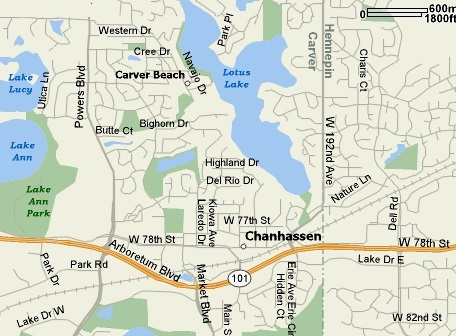 It is simply listed in the census as rural Chanhassen with Carver Beach crossed out and then written again as if the Census taker was not quite sure where she was. Carver Beach is on Lotus Lake and today is prime real estate. Back then it was a community of small cottages and subsistence garden plots. Grandpa enjoyed fishing from the boat that Dad bought him. He was always accompanied by his dog, Joe, who managed to get into places where dogs weren't intended. In the winter he would trudge out onto the lake with his home-made fishing rig. It consisted of one of his old canes with string wound around dowells that he inserted in the shaft. He fastened an old ice pick into the end, and he was good to go. Those were the days before ice augers and when you chopped through the ice with a long handled chisel. Meanwhile back on the West side of St. Paul. Dad, after his stint in the CCC's, was almost daily, walking or taking the street car, across the Robert Street bridge into downtown St. Paul looking for work. 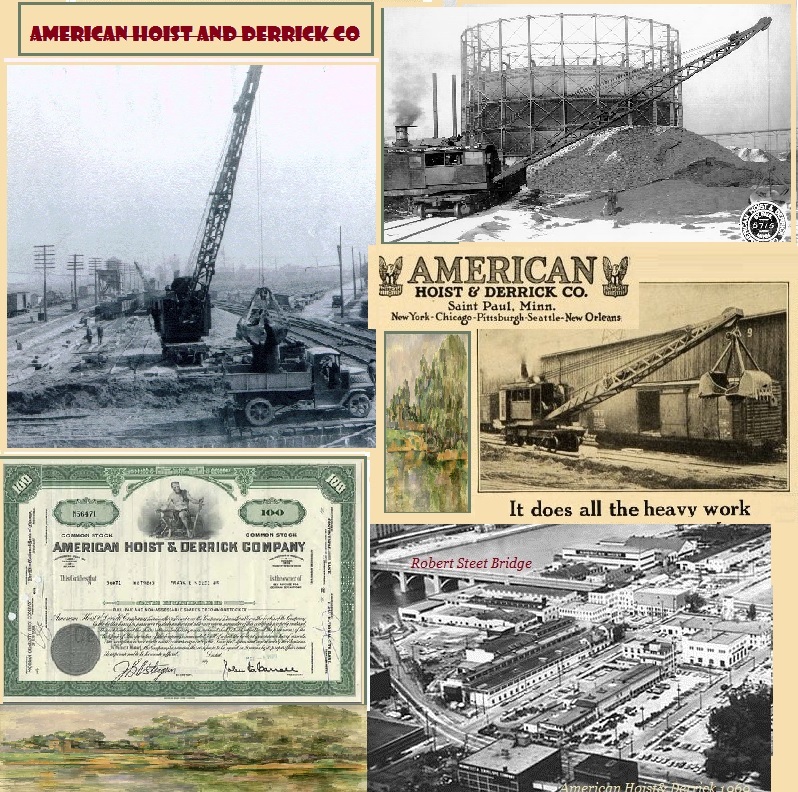 He would frequently glance over at the American Hoist and Derrick buildings at the South end of the bridge looking for "hiring now" signs. A number of his neighborhood buddies, including his close friend Henry "Babe" Schmahl, were or were soon to be employed there. And then finally in July of 1936 the "HIRING" sign was up, and the young Reynold filled out the application and was hired as a "Machinist Apprentice".